Realm laws are laws concerning how the realm is governed. They require the Conclave DLC, and replace both demesne laws and crown authority when the DLC is active. 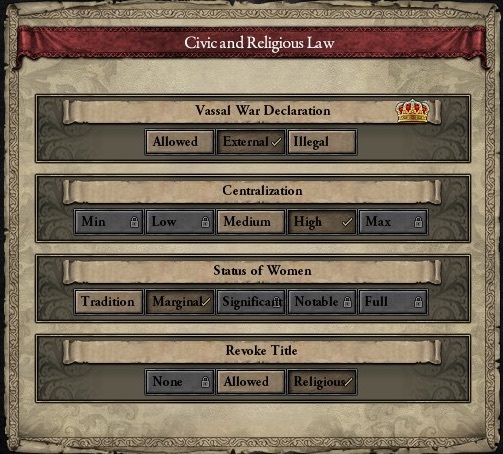 Note that nomads only have the "Status of Women" law and vassal obligation laws available to them. Viceroyalty and centralization laws remain unchanged, but are now found on this tab. Laws controlling title revocation and inheritance by characters outside the realm are now passed separately, rather than being components of crown authority. The new laws allow rulers to shift the focus of the obligations of the realm's vassals, between more taxes or more levies. Thus, they trade off taxes vs levies, rather than taxes and levies vs opinion. Obligation laws now determine the minimum vassal levies, replacing one of the features of crown authority. Nobles prefer tax-shifted obligations, while burghers prefer levy-shifted obligations. These tend to be the opposite of what their lieges prefer. Opinion bonuses and penalties from law changes are only temporary, however. Iqta government do not have Noble and Church obligation laws. Similarly, Feudal governments and Theocracies do not have Iqta obligation laws. Note that at the default level, Nobles do pay some tax, which is not the case if Conclave is not active. For all but Tribal Obligations, Legalism 5 and 6 is needed for the Focused and Heavily Focused obligation on either side, respectively. To increase tribal organization, a tribal ruler must be independent and have at least a ducal title. Realm peace can be temporarily enforced via the Council tab regardless of the standing law. Restricting external wars prevents vassals from launching holy wars, which risks tanking the religion's moral authority if they lose. Through legislation, it is now possible to empower women by allowing them to take positions on the council. Most council positions first become available to women related to the ruler (dynasty members, close relatives, wives, and concubines), landed vassals, and in some cases nuns. At the second highest level, it is possible for Muslims and nomads to pass Agnatic-Cognatic succession, which in turn allows matrilineal marriage. At the highest level, it is possible to pass the Absolute Cognatic succession law, and female rulers do not suffer opinion penalties. These changes are more significant to Muslims and nomads, who previously could only use Agnatic succession and patrilineal marriage. The ability to appoint female commanders expands your talent pool as well.